We’re sitting in Bangkok airport waiting for our connecting flight to Samui. We’ve had a pretty smooth trip so far. Anth drove us to the airport and we had a short line in customs – in fact there weren’t many people in the airport at all. 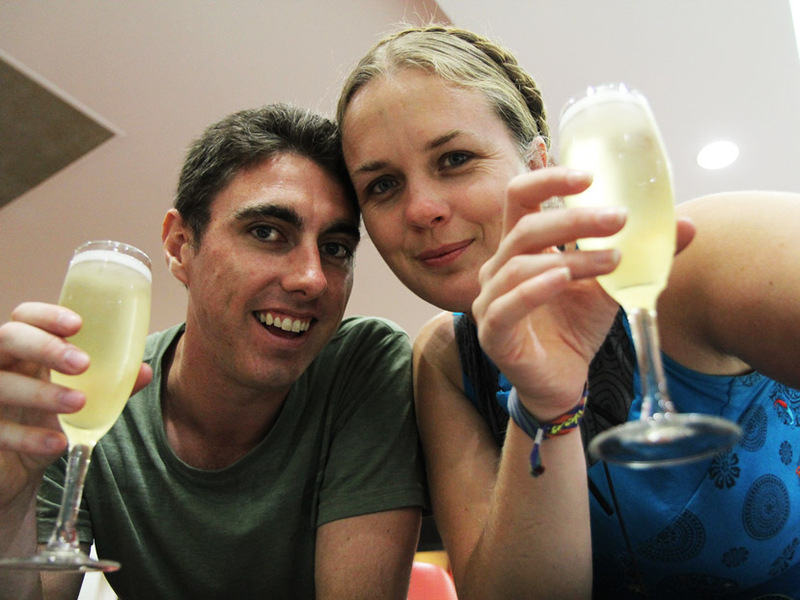 We decided, since we had some Australian coins on us, that we’d have a celebratory glass of sparkling wine to commemorate the beginning of our trip. Sitting down on the plane made it all seem very real and we got as excited as you can get at 1am after several nights of short sleep and a number of glasses of wine. We flew Thai Airways and, as far as it possibly could be, it was a pretty good experience. Good food, huge selection of things to watch, many drinks being offered and we even had a spare seat in our row so, while Luke had the window seat, I got room to stretch my legs a bit. We slept for about 4 or 5 hours and right now I don’t feel too bad at all. We have a 2 hour wait before our next flight then it’s on to Koh Phangan. Yay! For everything;). Glad the furry ladies are getting along ok. I’m trying to update! I think the internet here is a bit slow, it doesn’t seem to want to let me do anything more than comment on things >.< I'll try again! Woot! Its all very real once you’re on the plane 🙂 much love.